In the play Twelfth Night, William Shakespeare famously wrote ‘some are born great, some achieve greatness and others have greatness thrust upon them’. While it’s a remarkably good quote, I feel today (September 15) the presence of a man from Florida has altered it for a new modern age. ‘Some are born great, some achieve greatness and then there is Lane Pittman, a man who has stand offs with hurricanes’. 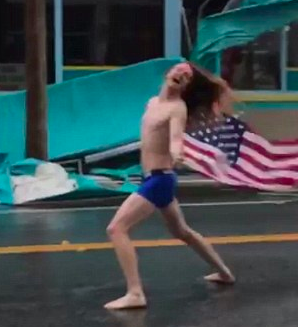 Lane, better known as ‘Florida Man’, clearly has a thing for storms. 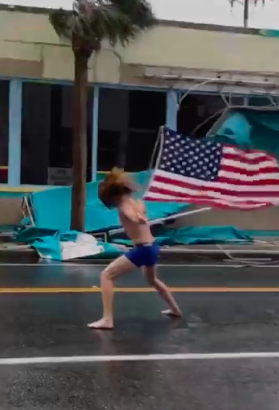 He’s best known for infamously facing up against both Hurricane Matthew and Hurricane Irma, wearing nothing but a pair of boxers… oh and waving an American flag of course. So while news of Hurricane Florence frightened many, Lane got excited, seeing it as an opportunity to perform his famous stunt once again. He even set up a GoFundMe page asking for people to donate to his cause so he can afford to get to South Carolina. 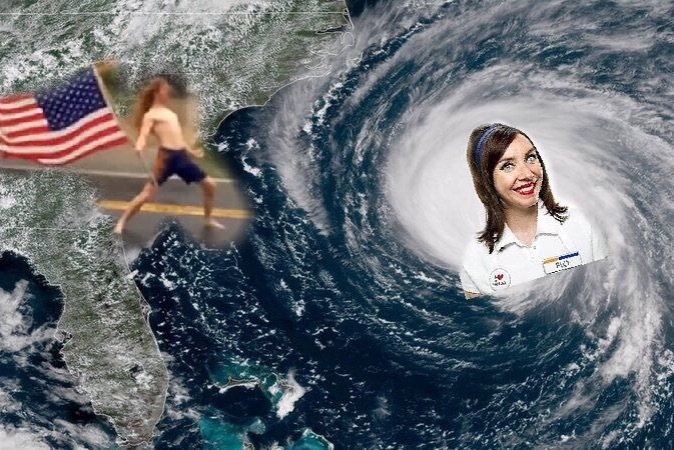 Send Lane to fight Florence. Pay for my gas/coffee and I’ll go fight Hurricane Florence. ‘MERICA BABY!!! We stick together. Lane’s words clearly encouraged many as he smashed his target of $150, raising a total of $935 at time of writing (September 15). 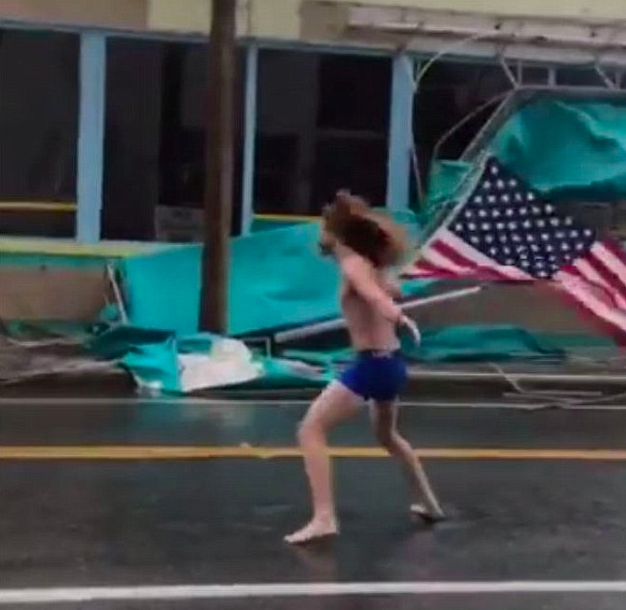 Keeping to his promise, Lane stepped out on Myrtle Beach on Friday (September 14) wearing nothing but a pair of shockingly bright blue boxers, waving a giant American flag in the middle of the 85mph winds. As heavy rock music plays in the background, Lane lets loose his mane of ginger hair and poses valiantly, seemingly undisturbed by the storm which surrounds him. The internet is clearly still in awe of Lane and his antics – the video has received over 210,000 views at time of writing (September 15). Now that really is quite something. A reporter form the Fox Business Network managed to catch up with Lane following his dramatic display for a quick interview. I’m just being free and American man. I’m not going to let nothing oppress me, especially no freaking hurricane. While Lane’s words got a round of applause from those in the news studio, the reporter wasn’t exactly impressed. Look I have already been viral. Just look at ‘Hurricane Headbanger’. Astonishingly the ‘Hurricane Headbanger’ video has received over 3,700,000 views meaning it’s getting ever so close to hitting the four million mark. The internet clearly loves Lane’s spirit so shake off the haters man and keep doing you!